Purchasing a farm share or “CSA” has developed into the perfect solution for many consumers to maintain a supply of fresh, seasonal food directly from local farms. As a result, Philadelphians have grown accustomed in recent years to a fantastic array of local produce, courtesy of our access to farmers-markets and farm-shares, citywide. I was pleased when I found in 2012, that an organization had emerged to accomplish those same goals but that rather than bringing juicy, hand-picked heirloom tomatoes, they were bringing Art! CSA (in this case standing for Community Supported Art) is hosting spirited, creative events that include lively conversation, food, drink and, most importantly, Artists! All you have to do to be part of the party is to buy a share from CSA Philadelphia. The first iteration of the Philadelphia CSA began as a collaboration between two Philly Artist Collectives: GrizzlyGrizzly and Tiger Strikes Asteroid: Philly (TSA Philly). 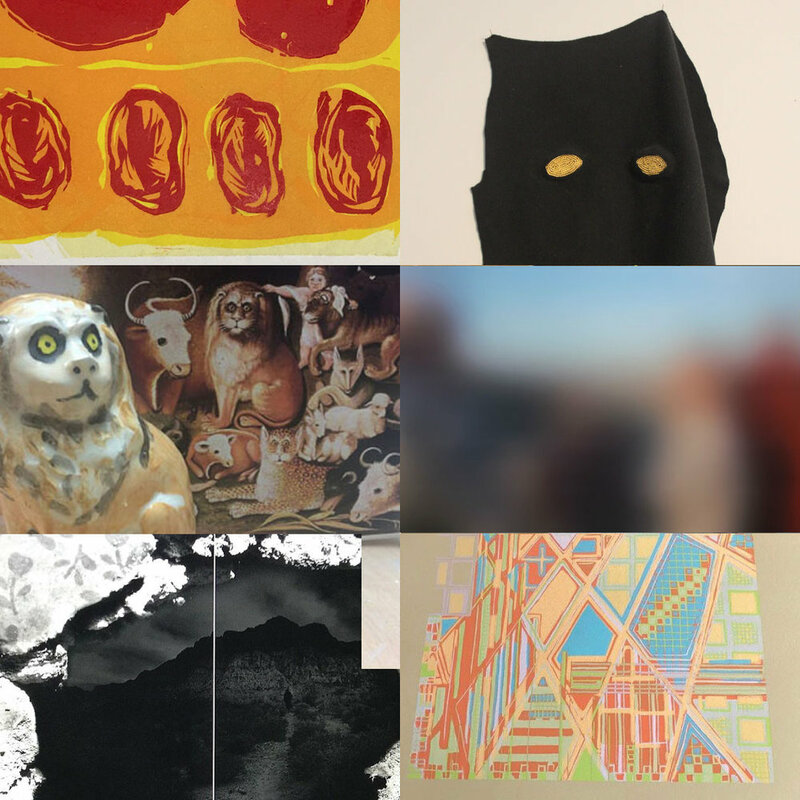 The 2012 collection included nine artists; Sarah Kate Burgess, Anda Dubinskis, Jacob Feige, Sarah Gamble, Brian Giniewski, Ivanco Talevski, Brent Wahl, Douglas Witmer, Linda Yun. The current season’s organizers include members of GrizzlyGrizzly and include two former TSA Philly members. The 2017 collection consists of works by six Artists; Grimaldi Baez, Leah Bailis, Marc Blumthal, Julianna Foster, Alexis Nutini, Lucia Thomé. As a member of TSA Philly I had the opportunity to participate in the 2012 launching of CSA Philadelphia. The launch was a transformative experience that opened my eyes to a new and varied array of Philadelphia artists and collectors. I was assuredly not alone in my appreciation of the CSA’s addition to the artistic landscape of Philadelphia. When I sat down to discuss CSA with Cindy Stockton Moore, Anne Schaefer and Jaime Alvarez they only reinforced my glowing admiration of the project. TS: The three of you have been working together on the CSA since the beginning. Can you tell me about the origin of the program and how the collaboration all began? AS: Philadelphia's Community Supported Art Program is modeled after the very successful program developed by Springboard for the Arts in Minneapolis, MN (2010). Their model has gained a lot of notoriety and has been replicated throughout the country. In 2012, GrizzlyGrizzly partnered with Tiger Strikes Asteroid to implement the Springboard model with the goal of cultivating an open, authentic and deep connection between artists and collectors. The program sought to create dialog through a series of events that revolved around local and innovative artwork. This motivation continues with our current CSA program. The 2012 Community Supported Art was supported by a grant from Springboard for the Arts, funded in part by the John S. and James L. Knight Foundation. It is one of two inaugural CSA programs in Philadelphia. This funding along with our generous local sponsors was instrumental in starting the program and enabling us to move some proceeds from that iteration forward toward the initial funding of the 2017 program. TS: Why is it important for artists to be able to sell their work through the CSA? CSM: This economic model works for artists in that it connects them directly to a viewer - and supports their project much like a grant would. Instead of working solely on speculation, the artists have a clear idea of their recompense before embarking on an edition and can budget their time and materials accordingly. The organizers also serve as facilitators, so artists can often try out new ideas or materials for their CSA share, many venturing into the idea of multiples for the first time. JA: I would second Cindy’s comments. I would also add that artists usually make work prior to being seen in public, or for emerging artists, it may be possible that work that is made will be put out into the public. With the CSA, they are granted funds that allow them to create works that couldn’t be achieved otherwise. TS: Making a large edition/series or works can be a herculean task. 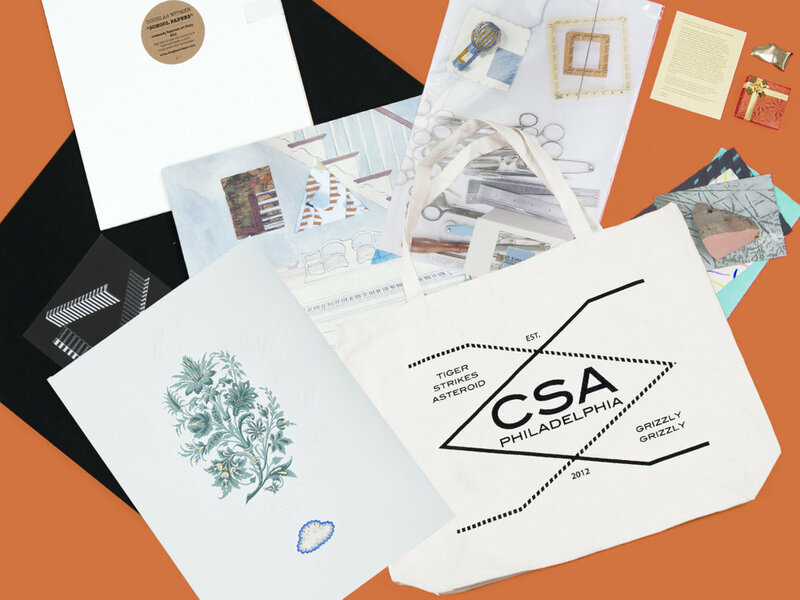 How do the artists benefit from participating in the CSA? CSM: They are participating in a project that values and compensates their effort and vision. They are paid for their work in advance of its production, so that's material compensation. But they are also connected to a new audience, so that's building a community for future involvement and support. Sometimes that takes the form of potential sales, but often it materializes socially in terms of new connections and access to techniques or material knowledge. JA: I would also add that the artists should feel free to attempt something new and different from their usual work, or create something that they couldn’t have afforded to otherwise. TS: How does the community benefit in supporting the project? CSM: Shareholders benefit across the board also. Their contribution buys them six great pieces of art -- which is a bargain from any viewpoint. More importantly, shareholders have many chances to meet and talk to the artists. The work that ends up in their homes will contain that extra knowledge and connection -- I know for me that makes the art even more valuable, increasing the daily enjoyment of living with contemporary art. Also, they should feel good about what they are supporting -- this economic structure is a different way of thinking about supporting the arts, a more accessible way. The shareholders are making that change happen. TS: What might the editioned artworks impact on their collectors be? CSM: I think that impact will vary as much as the shareholders themselves. For some, it might be the start of a new collection, for others it may blend into their already well-established one. Our hope is that the connections between artists and shareholder will continue to build over time, and lead to outcomes we cannot begin to imagine. JA: I see it as a potential to open up a new collection, or to buy something as an investment into their local community, instead of adding something mass produced into their collection. My personal hopes are that with committing to the CSA, they are also motivated to look into local artists and purchase works from them or other local artists. TS: I think there is amazing potential for the CSA, particularly in a city like Philadelphia. We are a hub of generous and diverse creative history that seems to get more energized each year. The city is alive with celebratory events like The Parkway’s 100th Anniversary, Cai Guo-Qian’s Firefly Pedicab service and The Mural Arts/Monument Lab project. The CSA is bound to gain traction and become a strong thread in the cultural fabric. TS: My fondest memory of the program was going to visit artists in their studios throughout the city. I remember being awestruck at the incredibly diverse and multi-faceted group of artists I met, it was like a “Philly Art21!” When developing the selection for the CSA, how are the artists chosen? CSM: For the 2017 share, we asked local arts organizations, curators and collectives to nominate artists -- it broadened our search and introduced us to even more people working in Philadelphia. I am always surprised by the breadth and depth of the community here. There are so many interesting people doing interesting things. Narrowing it down to the finalists was a daunting task! AS: Agreed! Seeing the artists in their studios is a real treat. For this selection process, not dissimilarly from the selection in 2012, we were looking for a range of artistic disciplines to be represented through the work of the final six artists. The thought process was through that range, potential collectors might gravitate to something they were familiar with or partial to and then take a risk on something they might not have considered collecting. For example, someone interested in photography might initially be intrigued by Julianna Foster's work and then though the CSA discover they love Lucia Thomé's sculptures - thereby broadening the diversity of pieces in their personal collection. JA: The choosing of the artists is probably one of the best parts of organizing the CSA. The first round list of artists usually is composed of artists via many factors. Personally, I think people are first nominated because of their work within the arts community, their reputation, and the quality of their work. After a few rounds of pairing down artists to a much more workable list. From that list, we contact the artists, explain to them the project and schedule a visit if they are willing to participate. After that visit, there is quite a bit back and forth with the organizers in trying to curate a group of artists to make an artist’s share that people would be interested in purchasing. The whole process is really difficult because we would love to work with all of the artists we nominate and provide a venue for their amazing projects. TS: The “Pick Up” events are remarkable celebrations that are open to the public as well as subscribers and include demonstrations by some of the artists in the collection. The last pick up in 2012 at Second State Press featured a Printmaking demonstration by Ivanco Talevski. It was lovely to observe the public interaction. I had never been to Second State Press, it was an even more special occasion to meet Ivanco and explore the venue. Can you talk about the relationships the CSA and artists have with the pick up venues? CSM: One of our goals is to introduce shareholders to organizations and spaces around the city, but we also make a point to host one 'in-house' pick-up, this year at GrizzlyGrizzly. The pick-up will take place during a solo-exhibition by Brent Wahl, who was a 2012 CSA artist. For me, it reflects the on-going relationships we are building between the artists, organizers and shareholders. The project is a beginning for these long-term, deeper connections. October will also be our first month back in the 319 building after the fire [fingers crossed] so it will have personal resonance. AS: I'm so glad you have a great memory of that event. Not only was that event and venue special as a result of the demonstration that Ivanco Talevski did, but Second State was instrumental in the production of Anda Dubinskis' edition. She worked with Second State to complete the silk screened portion of her 2012 CSA edition. This time around we have found other local venues to be just as positive and excited about the project. To preview the work of the 2017 artists, get the current shareholders together for a fun social gathering, and expose new collectors to the program and an exciting local studio building, we had an event at Globe Dye Works. Until recently, my studio was located there and Globe Dye Works is home to so many amazing artists and small businesses - it is a lively mix of dynamic art and commerce. We were able to host a pop-up exhibition of our 6 CSA artists' works as well as many members of the Globe Dye Works community opened up their studios. I created a limited edition print to commemorate the 2017 CSA which is available for our early subscribers to the 2017 CSA (there are some still available). In upcoming events, a raffle and our three pick-up events, we will continue to partner with venues that complement our mission of making opportunities for our community to come together over local, innovative artwork. JA: As organizers that have come from artist collective, or artist run galleries, connecting the new collectors with the artists, and other creative spaces within the city became an integral part of the CSA program. In the Farm Share analogy, I guess it would be inviting the Shareholders to where the food is grown/art is created. The spaces that have been involved in organizing the CSA, Tiger Strikes Asteroid (TSA) and GrizzlyGrizzly, are always looking to open up their doors to anyone who wants to know more. The way that TSA and GrizzlyGrizzly came around, creating spaces that contrasted with commercial gallery spaces, in order to get more artists work viewed. So it seemed natural to bring the buyers into our spaces, and other spaces around the city in order to educate the larger community. TS: Participating in the CSA Program exponentially widened my circle of friends, brought on two new colleagues at Tiger Strikes Asteroid Philadelphia, introduced me to new venues and neighborhoods and literally opened my eyes to the vast talent pool in Philadelphia. Can you speak specifically about “Philadelphia” and how you feel about supporting Philadelphia Artists? AS: We have already touched on the incredible volume of talented artists living and working in this city and I have been proud to be part of this community for the better part of the last 17 years, so, it has been particularly meaningful to be a part of a program that has Philadelphia artists at its core. I believe buying artwork is an investment in culture. The promise of our community depends on our commitment to each other and the recognition of the value in what we do. I think that it is essential that we consider ways in which we can do this beyond the conventional art market as well as find ways to increase the depth and breadth of our community. The hope is that, the Community Supported Art Program is an option toward this endeavor. JA: While Philadelphia may seem small compared to New York’s vast artist community, being an organizer for the CSA really did help me realize that Philadelphia offers so much more than I originally expected. At times criticism of how the Philadelphia arts community seemed very compartmentalized, or “cliquey”, but the CSA project, and the Citywide exhibition of 2013 looked to break down those walls by extending invitation to all our contacts, and their contacts in a way to open up more dialogue. CSM: The great thing about the CSA program is that it helped connect new potential collectors with artists. I remember meeting people who came as far from Cape May and Baltimore to collect their pieces. If we can reach out to those people, and show what Philly artists spaces have to offer to the public. TS: The 2012 CSA left me feeling joyful and thoroughly nourished by the community that exists here in Philly. I was thrilled to see the program make another appearance. I understand that the care and development of a project like this is a gigantic investment. What do you see as the future of CSA Philadelphia? CSM: We are already talking about the next iteration of the CSA - and what local organization will organize the next round. Stay tuned for an official announcement in December! TS: TSA Philly purchased a 2012 share as a group. We “shared” the spoils in a random lottery. When I opened my treasure, I found that I received #1 in Anda Dubinskis’ edition Flora & Fauna : Memory & Hope. I had Anda as a drawing teacher when I was a student at Moore College of Art and Design and have long admired her magnificent work. This was a magical moment for me. Can you share some of your magic CSA moments? CSM:This spring we had a CSA event at Martha in Kensington where we made an insane amount of donuts. While I was working the fryer downstairs, it turns out that my five-year son was upstairs doing a collaborative drawing with Jaime and 2017 artist, Grimaldi Baez -- this amazing scene with aliens and spaceships. It showed me that my CSA experience is one small facet of what happens at these events. Otto will have a special relationship with Grimaldi's work when we get in from the share -- he's met the artist, worked with him, probably climbed on his lap. That's magic in my book. AS: In 2012, I was closely involved with helping the artists assemble and package their editions. It was so special to see the care and attention each put in to this process. The consideration of how shareholders would experience the work from the moment they picked it up through the time they would spend with it in their homes was really lovely. Many artists included labels or inserts that thanked the shareholders and explained their project. Additionally, I loved being able to see each work in the editions, as nearly all (and many in 2017) were unique or variable editions. I felt privileged to be a part of this process as I believe I was one of the few to see all 50 of the works by each artist in one place at a time. Seeing their commitment to the project and their talent manifest in their editions was really magical. JA: I worked as the official photographer of the CSA in 2012, and have been working together with GrizzlyGrizzly documenting the 2017 edition, partly because the birth of my son had made me stay at home more than I expected. They have really done an amazing job putting together a great group of artists and events that people will enjoy. The Martha event that Cindy mentioned really showed how much of a community can come together to enjoy a good time, and raise some funds for artists. Participating in the 2012, and seeing that collectors from all over came to pick up their shares was something that I felt was magical and that we had hit the goal of getting these artists works out for the people. Lastly, the friendships made from the experience, of the organizers and buyers, and the events, all was just super amazing. I’m looking forward to the new “Pick Ups” and seeing what people will think when they receive their works. TS: Thank you all so much for your dedication to Philadelphia Art, Artists and Collectors and for enriching our community us with this abundant experience! I look forward to the next robust season! The First Community Supported Art Viewing & Shareholder Pick-up is on Sunday, September 24, 3-5pm at the Esther Klein Gallery, 3600 Market Street, Philadelphia PA.
Be sure to follow @csaartphilly on Instagram. You will find fantastic in- progress shots and video of all of the 2017 artists’ season and Pick Up dates and events!